An eight-week personal study with other caring women healing from post-abortion. These are individual or group sessions. Details: (408) 847-8880. A course for motorists 50 and older is taking place. Must call and register to get date and location. Participants will familiarize themselves with driver safety and new laws. No tests. Course, materials and instructor provided. There is a minimal DMV certificate fee. Details and to register: (408) 779-7117 between 1 and 7 p.m.
Free guitar lessons at the Gilroy Senior Center, 7371 Hanna St., from noon to 1 p.m. Details: (408) 846-0414. Line dancing lessons from 7 to 9 p.m. at the San Martin Lions Club, 12415 Murphy Ave.
Group meets at 6:30 p.m. at South Valley Community Church, 8095 Kelton Dr., Gilroy. Details: (408) 848-2363. Food Addicts in Recovery is a 12-step program for those suffering from overeating, under-eating or bulimia. Meetings are at 7 p.m., Advent Lutheran Church, 16870 Murphy Ave. Details: 800-600-6028 or www.foodaddicts.org. Meet at the Merrill Gardens Activity Room, 7600 Isabella Way, from 1:30 to 3:30 p.m. Details: Judy at (408) 607-8254. The Valle del Sur region of the Antique Automobile Club of America meets at 7 p.m. at the Villa Mira Monte on Monterey Road. Details: www.valledelsur-aaca.com. Meet from 1:30 to 2:40 p.m. at Merrill Gardens, 7600 Isabella Way. Details: (408) 607-8254 or tech@livingco.com. Bridge games begin at 1:20 p.m. Mondays and 10 a.m. Thursdays at the Gilroy Senior Center, 7371 Hanna St. Details: (408) 921-8512 or email win.stone@charter.net. Mon., Wed., Fri. & Sat. From 5 to 6 a.m. and most Saturdays from 7 to 8:30 a.m. at Gilroy High School. Masters swimming for adults looking to get in or stay in shape, or for triathletes looking for more swim time and/or instruction. Details: www.gilroygators.org or email gilroygatorsmasters@gmail.com. The Gilroy Ladies Golf Club is looking for new members. Details: (408) 779-0886 or (408) 776-7509. Each class consists of a short introduction, a 20-minute meditation, and a brief discussion. It takes place from 6:30 to 7:15 p.m. E-mail artofyogamorganhill.com, or drop by 16165 Monterey Road, Suite 200. Suggested donation $5. No one turned away. The St. Catherine Community Closet is open from 10 a.m. to 1 p.m. and the first Saturday from 10 a.m. to noon. Get free, gently-used clothing and household items, at 13570 Depot St., San Martin. Details: (408) 857-4516. “Life Hurts God Heals” is an eight-step program for middle and high school students providing life skills for students. Free classes take place from 6:30 to 8 p.m., at Cathedral of Faith, 7250 Forest St., Gilroy. Details: Suzie at (408) 497-2494. The Morgan Hill Flower Lovers meeting will resume their fall meeting schedule at the Morgan Hill Community and Cultural Center from 12:15 to 2 p.m. Dessert will be served at 12:15 p.m. LCFF Gardner Joan Clout1ier’s will speak about the benefits of planning a fall and winter vegetable garden. Find support, respite, and education 6:30 p.m. in the activities room at Merrill Gardens, 7600 Isabella Way. Details: Anne Seckinger at (408) 857-7811. If you love to sew and work with fabric you will enjoy meeting with like-minded people. They are part of a group of sewing enthusiasts who challenge and teach each other sewing skills. They meet at 10 a.m. in the Jackson Oaks area of Morgan. Details: www.asgsanjose.org. If you are a woodworker or enjoy working with wood you might enjoy joining the South Valley Woodworkers, serving South San Jose, Morgan Hill, Gilroy, San Martin and Hollister. The group meets at 7 p.m. in Morgan Hill. Details: www.southvalleywoodworkers.org. Indivisible South Valley, a grassroots effort aligned with the national Indivisible Movement, works to protect democracy and core values, focusing on local communities. 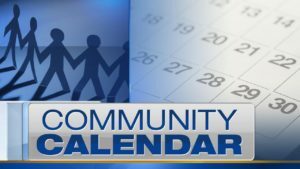 Meetings are from 7 to 8:30 p.m., at the clubhouse on Montoya Circle. For family and friends affected by a loved one’s drug abuse, these meetings take place from 7:30 to 8:30 p.m. at Gilroy First Baptist Church, 8455 Wren Ave. Learn leadership and life skills at the Pacheco Pass 4-H meetings from 7 to 8 p.m. Details: email pachecopass4hclub@gmail.com or call (408) 824-8201. Creative writing class, no experience required, meets at 2 p.m. for 13 weeks, Merrill Gardens, 7600 Isabella Way. Details: Amanda Chiado at (408) 621-5114. Doors open at 4 p.m. with early games starting at 6 p.m. at the VFW, 74 W. Sixth St.
A recovery group meets at 6 p.m. for food, 7 p.m. for large groups and 8 p.m. for small groups, at New Hope Community Church, 8886 Muraoka St. Details: (408) 398-5107. Come to a safe space to play games and have fun from 6 to 9 p.m. at the El Portal gym, 222 I.O.O.F. Ave. Food is served. This program is for ages 13 to 19 though younger children are allowed if accompanied by a parent or sibling older than 18. A permission slip is needed if attending for the first time. Details: (408) 846-0460 or (408) 846-0313. The San Martin Horsemen’s Association meets at 7 p.m. at the San Martin Lion’s Club, 12415 Murphy Ave. Details: www.smhorse.org. Players meet at 8:30 a.m. for an hour of jamming at Café 152 Bread Company, 60 4th St. They play songs from their past three songbooks, which are available at www.GilroyUkuleleJam.com. Join the Gilroy Garlicky Group of poets for poetry fun from 3L30 to 5 p.m. at the Gilroy Public Library, 350 W. 6th St. Come join the fun. Very low key with all levels welcome from the south valley. Meets at 2 p.m. at the United Methodist Church, 17175 Monterey St., and provides a safe place to share grief. Details: (408) 607-5779 or email platnumer@aol.com. Limelight Actors Theater’s 2018 comedy and annual fundraiser for The Michael J. Fox Foundation for Parkinson’s Research plays at 8 p.m. (doors open at 7 p.m.) Nov. 16, 17, 23, 24 & 30, and Dec. 7 & 8; and at 2 p.m. (doors open at 1:30 p.m.) Nov. 25 and Dec. 2. Tickets are available at www.LimelightActorsTheater.com. Visit the Veterans Memorial Hall, 74 W. Sixth St., from 2 to 6 p.m. and buy tamales to benefit scholarships handed out by the American Legion Post 217. They will be selling pork, chicken, and cheese with jalapeño. They are $24 a dozen. Details: (408) 310-9419 or (408) 763-7744. The Gilroy Downtown Business Association presents the annual Holiday Parade and Tree lighting beginning with a Doggie Dress-Up at 2:30 p.m. There will be vendor booths from 2:20 to 7 p.m., performances from 3 to 5 p.m. and the parade beginning at 5:30 p.m. at 5th Street and Monterey Road. Details: (408) 842-0005, email nancy@downtowngilroy.com or visit www.downtowngilroy.com. The Gilroy Veterans Memorial Hall is hosting a Veterans Resource Fair from 10 a.m. to 2 p.m. at 74 W. Sixth St. The event will include medical professionals, counseling, benefits assistance, and some local businesses with services specifically for veterans. Flu shots will also be available for veterans, who need to bring either their VA card or a DD214 for proof of service. California Veterans Service Officers will educate veterans on benefits, help file claims and discuss education assistance. Details: email sscvmd@gmail.com or call (408) 842-3838. The Gilroy Lions club will host its 44th annual Omelet & Pancake Supper from 5 to 7:30 p.m., at the Gilroy Presbyterian Church, 6000 Miller Ave. For $10 adults, and $5 for children ages 12 and younger, you can eat all the pancakes and omelets you want. For the Gilroy Lions club, 100 percent of the profits go toward providing sight preservation for those in need in the South County. Details: Dean at (408) 847-5564. An illustrated Power Point presentation of the Wright Brothers and their accomplishment takes place from 1 to 3 p.m., at the Wings of History Air Museum, 12777 Murphy Ave. The presentation will be followed by a docent-led tour of the museum’s full scale replica of the Wright Flyer. Details: museum1903@gmail.com. Fill a bag with books for just $8 or $5 for members. The sales begins at 10 a.m. at the Gilroy Library, 305 W. Sixth St. Proceeds support free classes and events at the Gilroy Library. Details: pages2go@gmail.org. Please send calendar items to editor@gilroylife.com. If you wish to send a Calendar Page item to Gilroy Life, please send your event's details to editor@gilroylife.com. If you have a good quality publishable photo or a flyer of the event, please feel free to send that to the same email address.